Tingling and numbness in your toes -- possibly bad enough to get in the way of a good workout -- has many possible causes. Some are simple to remedy. Toes that tingle and go numb may be due to the wrong footwear, nerve irritation and exercise position. However, if your problem is persistent and doesn't respond to simple fixes, check with your doctor to rule out a medical condition. A simple reason may be causing the numbness and tingling in your toes as you exercise -- ill-fitting shoes. Shoes that are tied too tightly or are too small affect your circulation. If one foot is bigger than the other, you’ll need looser lacing on that foot. Also make sure your socks are not too thick as this makes shoes too tight. Shoes that are brand-new and not broken in and shoes that are too old sometimes contribute to tingling and numbness. Purchase athletic shoes from a store where the staff is knowledgeable and test drive them in the store. Wear the socks you normally work out in when you try them on to get the right fit. 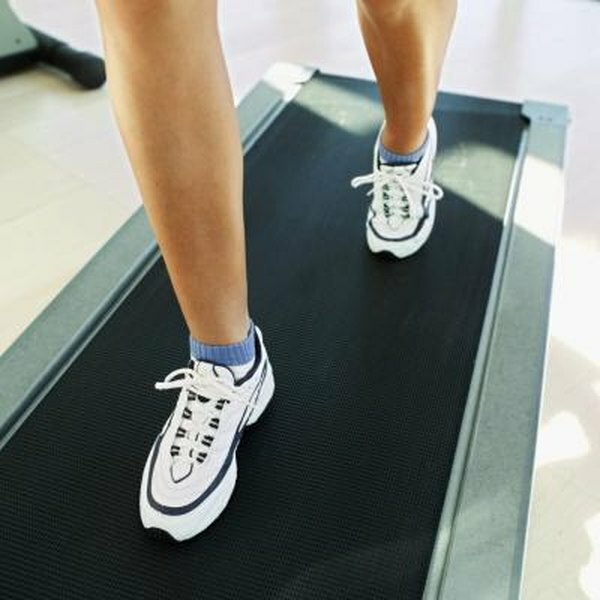 If you are working out on an elliptical trainer, you may experience “sleepy foot syndrome" similar to the numbness you get when you stand in one position without moving for a long time. On the elliptical, you are moving your body, but your foot is planted in one spot on the pedals. To prevent this, move your feet around a bit as you stride and wiggle your toes. Changing direction also helps to increase the circulation to your feet, which combats toe numbness and tingling. Nerve irritation, called a neuroma, is another possible cause. While the ball of your foot is the most vulnerable area, you may feel this between your third and fourth toe joints. Your toes may sting, burn or go numb. You also may have a burning or sharp pain on the ball of your foot. Taking a break from high impact activity or machines that increase pressure on the foot ball, like the elliptical, can help. Arch support or choosing different footwear helps as well. With your shoes, pay special attention to the shoe’s toe box. You need enough room for your toes both length- and width-wise. Also ensure the toe box is not too squishy. Toe numbness and tingling may be caused by chronic compartment syndrome. “Compartments” are groups of muscles, blood vessels and nerves that are covered by a membrane called a fascia that does not stretch easily. With this condition, pressure within a compartment builds, which affects your blood flow when you exercise. In addition to numbness, you may have difficulty moving your foot. Orthotics and anti-inflammatory medicines sometimes help with this condition, but not always. Cross-training to include lower-impact exercises or exercising on softer surfaces, such as turf instead of pavement, also can help. If these measures don’t help, give your doctor a call. To help prevent this syndrome, hydrate before exercise, warm up and cool down and follow a healthy diet. Bellevue Podiatrist: My Feet are Numb and Tingling After Using the Elliptical Trainer. Why?